Our new hanging glass range is very diverse as we have really thought ‘outside the box’ on this one and tried to incorporate a number of different designs and colours into the hangers. Most companies selling hanging glass just use a standard template and then replicate this again and again, but where we differ is that we have really tried to consider the needs of our consumers. The first range that we have made, is the lovely start and heart range which are great for a number of purposes. They are great for hanging on windows are brightening up a dull window scene or they are fab as gifts. Given on their own they are a great way to show someone that you love them, but you can also combine them and buy the different drops or use them as attach as wedding favours for example. The newest flower range of hanging glass is really striking as not only have they been handmade in our studio in Shropshire, like every item we sell, but they are completely unique as no one else is selling glass hangings of this design anywhere else. The idea behind them was that you could choose which colour most suited your colour scheme in your house or buy a range of colours so they all complimented each other. 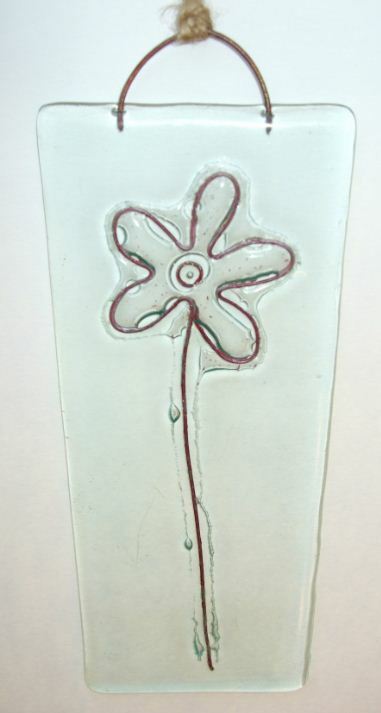 The wire hanging glass that we have made is also completely novel, as we liked the idea of a strong flower outline that was empty inside of colour so the feature that would stand out when hung was the shape of the flower. I reaaly like this hanging wire flower design. I purchased your Christmas bunting at the Much Wenlock Christmas Fair, and wondered if you make bunting for other occasions?